I really appreciate Snack-Girl readers, and am thrilled when someone suggests something that I need to review. Crystal wrote me a very nice e-mail admonishing me for leaving these veggie goodies off the site. So, today, I will fix this situation. 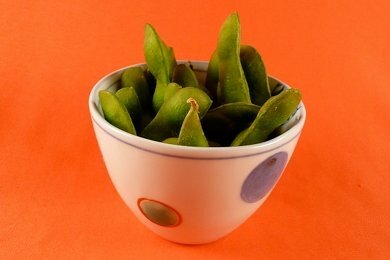 Edamame is wonderful Japanese snack that is readily available here in the U.S. Edamame is simply lightly salted soybeans in the pod. They have been either steamed or boiled to render them edible. You take of the pod, just like taking the shell off a peanut, and eat the bean that is inside. My first introduction to them was when I tried sushi for the first time. They are typically served as a starter before the sushi starts showing up. You can serve it hot, cold, or room temperature. All you have to do is let them thaw (on your counter-top or in the microwave). You can buy them at Sam's, Costco, or the supermarket. I found mine for $2.50 a bag in the freezer section of the natural foods section of a major supermarket chain. Nutritionally, you can't go wrong eating these. Basically, they are like a nut. They contain healthy fat, protein, fiber, and vitamins. I think these are an excellent replacement for Potato Chips and a much better choice than Veggie Chips. Because you have to shell them, you won't consume as many as when you are faced with a bowl of Almonds. Junghwa won the Winner! and RosyUndPosy Snack Bag Giveaway. I asked readers to share what snacks we should review. Thanks for all the suggestions. Junghwa would like to see more fresh fruit. What is your favorite veggie snack? Please share below. Love, love, love edamame!! I like to eat them as a snack when I'm craving something salty. I also buy them already shelled and use them as a veiggie side-dish and they are really good in a stir-fy. Hmmmm - now I'm really craving some edamame. Hey it's Dave from Seapoint Farms. We are the largest manufacturer of edamame in the country. I agree that you can't go wrong eating these veggie goodies. We just made a new stop motion video that promotes healthy snacking, thought you might enjoy it. Here is the link, we will be looking for your future snack posts.